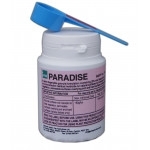 Paradise is a long lasting total weed killer, which, when used at the correct rates it will control most annual and perennial weeds for up to 6 months. For best results mix Paradise with a glyphosate product such as Roundup Pro Active. This will kill the weeds which are present, and also lay a residual barrier down which will kill any other weeds which try to grow.